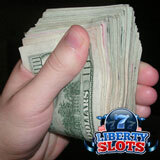 Every day this month Liberty Slots Casino, popular all over the world for its daily, weekly and monthly slots tournaments, is giving free spins on its most popular slots, and awarding cash prizes to top scoring players. A different slot game will be featured each day in December during The Countdown to Cash.Liberty Slots has games from Wager Gaming Technology which you won't find many other places. These include classics like Agent Cash. Two of Liberty Slots most popular games, the new Jester’s Wild and the classic Amazing 7s are featured in this Countdown to Cash. You'll also get free spins on the winter-sports-themed Golden Reels, Super Soccer Slots (launched during the World Cup), and the hot rod themed Hot Roller. Jester’s Wild paid out over $300K in its very first week online last month so it's no wonder it's become the number one slot game at Liberty Slots Casino. With its Spin Up Your Win feature, you can multiply a winning spin up to 5X. You'll also finding it generous with free spins. Amazing 7s is a classic slot machine game with symbols that include Bars, Bells and, of course, those Amazing 7s. It's an “option buy” slot game meaning there’s no Spin button. Instead there are Single Credit, Double Credit and Triple Credit buttons as well as a Play Max button.